I will admit that part of the reason I host Wild Things every month is to expand my own knowledge of how to cook with wild ingredients by learning through my peers. Having a window into their kitchens provides some of the most valuable culinary lessons I've learned. I hope that you feel the same way, whether you are a seasoned forager, or a newb, Wild Things is meant to spark your imagination, to help you see all of the lovely possibilities in "weeds." If you'd like to read the introduction to Wild Things seed month, click through here. You will find out more about finding and winnowing wild seeds (and grains, etc). 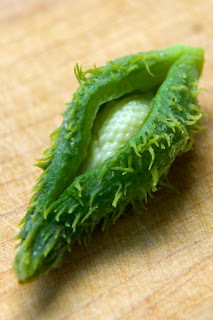 Several months ago, it was Mia of Transitional Gastronomy who came up with the idea of featuring seeds for Wild Things. She's a talented wild foods cook, so I knew she would come up with something amazing. And she didn't let me down. Just look at her gorgeous recipe for Fennel Seed Encrusted Pork Tenderloin and Lambsquarter Seed Cakes with a Green Fennel Seed and Vanilla Bean Buerre Blanc. 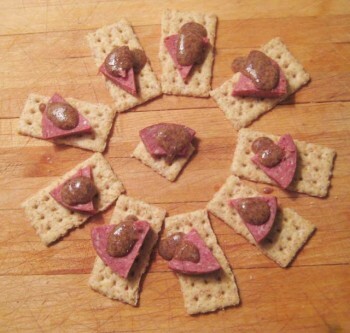 Herbalist Rosalee de la Foret of Methow Valley Herbs has shared an easy recipe for Dock Seed Crackers. 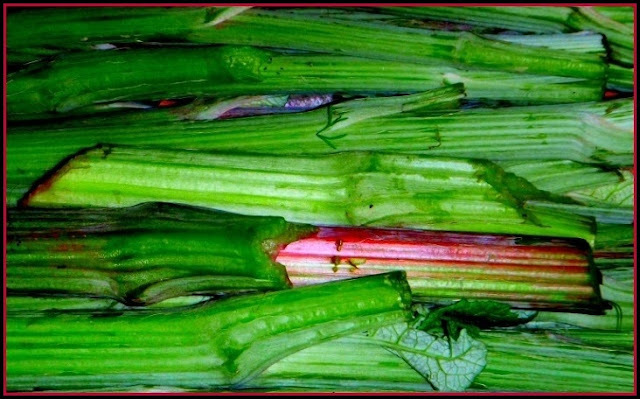 Her post also contains some awesome information about the nutritional content of the plant as a whole, and about how to use dock root as medicine. Also, check out her post about the edible and medicinal uses of poppy, which contains also contains some nice recipes. Wild Food Girl is the one who really turned me on to the virtues of pennycress seeds. If they grow in your area, it is well worth the time to harvest and winnow them. You can make some of WFG's famous Pennycress Honey Mustard. Hungry for another recipe that uses dock seeds? I know that I always am because dock is so abundant where I live. Have a look at the Dock Seed Cake from the Dyhanaverse. It is rumored that this hearty gluten-free cake is tasty enough to satisfy a donut craving. I know that many readers here are big fans of using nettle leaves in cooking. But did you know that nettle seeds can be used medicinally? In this post, herbalist Kiva Rose talks about how nettle seeds can be used as medicine for both the adrenals and kidneys. My buddy Christian, of the 365 Kitchen and I picked cow parsnip seeds together on the very first day we met. He is a master of charcuterie and meats, and has been skillfully integrating the unusual flavor of cow parsnip into his creations ever since. 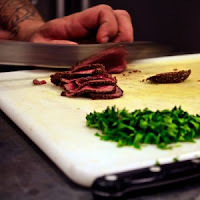 Take, for example, his recipe for Venison Carpaccio, which includes cow parsnip in the herb rub. If you are a fan of cow parsnip seeds like I am, and you want to try your hand at curing meat, then I can recommend the Cow Parsnip and Juniper Bresaola from Eat the Pig. I've personally tasted this one, and it is one of my all-time favorites. 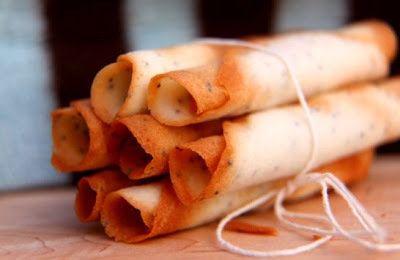 Food historian Ken Albala, of Ken Albala's Food Rant, has shared his recipe for Wild Susam. Normally this is a sweet made with sesame seeds, but can be made with virtually any wild seed similar in size and texture and oil content. The most intriguing version is made with nigella or "love in a mist"seeds which are black. First toast about a cup of aromatic seeds in a nonstick skillet. Then add 4 tablespoons of wild honey and 3/4 a cup of unrefined sugar (or even maple sugar) and a pinch each of cinnamon and powdered ginger. Then add two tablespoons of butter, Stir on medium heat until it begins to caramelize. Before it gets dark, pour out into a thin layer on a marble or metal surface brushed with oil. 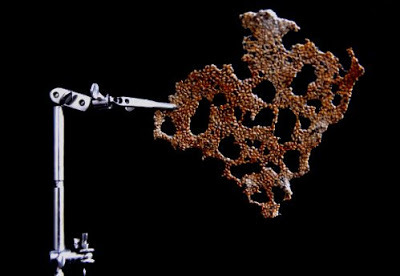 Let cool then cut into bite sized diamond shapes. Store in an airtight container. Queen Anne's Lace is not a plant for beginning foragers because of its resemblance to poison hemlock. But for those who know how to properly ID the plant, the bright parsley-like flavor of queen anne's lace seeds is versatile in the kitchen. 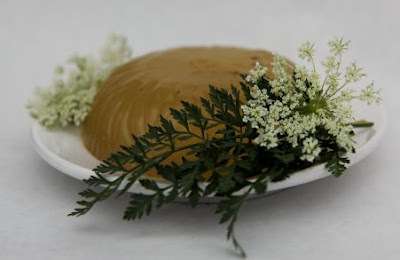 Here, I used them to make an elegant Queen Anne's Lace Sparkling Gelatin. All of the brand-new recipes I made for Wild Things this month used wild amaranth. I became a little mesmerized by their shiny black appearance. 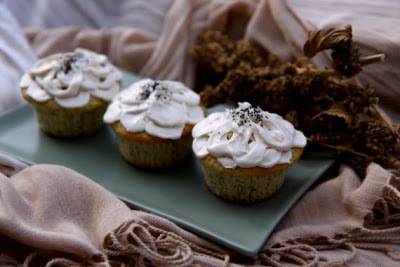 The first recipe I cooked up used them in place of poppy seeds in Lemon Amaranth Cupcakes, which are gluten-free. I've loved goat cheese blondies for years, but this time, I made them extra wild with the addition of a few foraged ingredients. 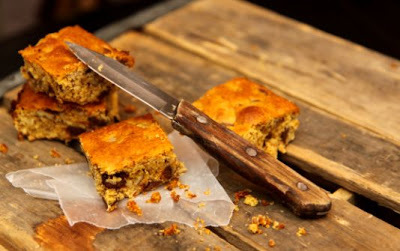 If you love desserts with complex flavors, then you will adore my Goat Cheese Blondies with Amaranth and Black Walnuts, which are also gluten-free. Every once in a while, I get the urge to make a fancy dessert. But even with fancy desserts, I prefer to make ones that come together without too much fuss. 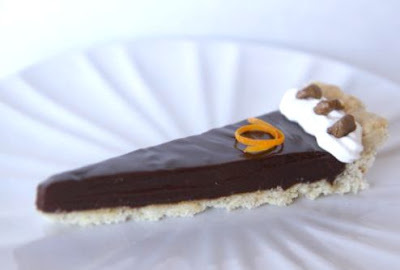 This Ganache Tart with a Black Walnut and Amaranth Crust looked impressive, and was a big hit among my chocolate-loving friends. 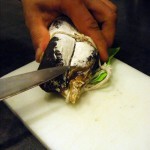 It constantly amazes me how wild ingredients can be so versatile in recipes, even ones that might seem a little tricky. Wild amaranth turned out to be a perfect fit in my Amaranth Tuiles, which are a light crunchy cookie (again, gluten-free). And finally, one savory recipe using wild amaranth. 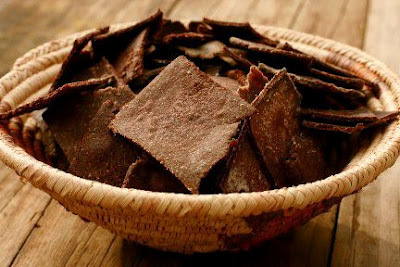 These thin Amaranth Crisps are so good that they are now a regular part of my repertoire. This is yet another gluten-free recipe, and these crisps can be whipped up in under 30 minutes, including washing the dishes. As always, I'd like to extend a heartfelt thank you to everyone who shared their knowledge with Wild Things this month. You continue to inspire me to try new dishes with wild ingredients. See you next month for the best of foraging in 2012! I bookmark all of these. Thank you putting them together every month. You are so welcome. It makes it worth it to know that you enjoy the Wild Things round up. Sweet! I've been waiting for this one. I have about a billion dock plants in the back of my property. I'm sure I'm must have some of these other things too. Take advantage of that dock! I have a bunch here, too. Use the greens in the spring and fall, and the seeds during the winter. It is such a useful plant, and it really tastes lovely! Whew, cow parsnip, that's a hard sell! I'm not one of the people who hate it, but it is hard to imagine on salami. Lots of great recipes to see here. Thanks! It takes a delicate touch, to be certain, but it is really lovely, I promise! So, it is seeds this month because we should be able to pick them now? I keep reading your posts, and then going outside and looking. One of these days, I'm going to put 2 and 2 together and just go for it. I'm so curious. Yes, absolutely! It is brown as anything here, and I can still step outside and see dock and amaranth and evening primrose. Most should do even better. Get a trusted local guide book, and go exploring. Take this as a time of learning! Count me among the inspired! Gonna make your crackers. I just had those crackers for dinner tonight. They are delicate in flavor, but stood up well to "truffle caviar." I hope that you enjoy them, too! I've only ever "foraged" fruit (does that count? ), so these recipes are stretching my imagination a bit. But I like them, and appreciate that there is someone out there doing this. We have dock here! I'm sure I've seen it. I want to make that mustard, and maybe some crackers to go with it..
Of course that counts! Fruit is the first forage of so many people. It is easy to identify, easy to collect, so friendly. Nothing wrong with that! One plant at a time. That's how I learned them, and that is how you will learn them, too! Some of these look pretty easy. I could do the easy ones. Crackers maybe?